Without any doubts, this is a five stars trek. The Isinliví- Quilotoa route links the beauty of the Sierra landscapes, the opportunity to have a glimpse into the traditional life of rural communities located at the very heart of the Sierra and the comfort of having cosy hotels waiting for you after demanding trekking days. The main part of the trek ends at the town of Quilotoa, a small indigenous and mestizo village situated on the rim of the still active Quilotoa Volcano. On the last day of the trek, we propose to go round the 10 km of the crater and enjoy the amazing view of the glittering emerald-colour water of the lake at the bottom of the volcano. If you like hiking light and enjoying the comfort of hotels afterwards, this trek is definitely for you. 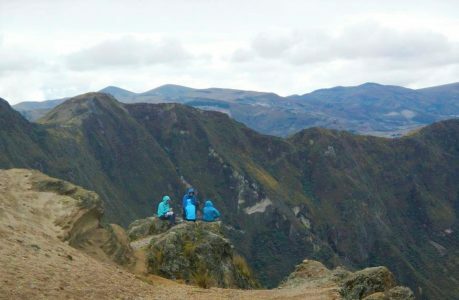 ** The trek maybe also done in the opposite direction: Starting at Quilotoa and going all the way down to Isinliví. This option is less physically demanding. 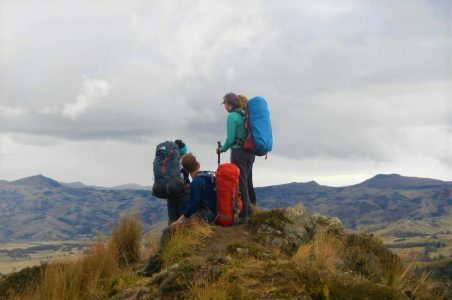 Altitude: The trek starts at 2.900 m and gradual ascent to nearly 4.000 m.
Best time to visit: From May to February, From October and November may be a bit raining but you can still do it. Observations: No camping equipment needed. Day 1 Transfer to Isinlivi & Cotopaxi National Park Walk. Day 2 Trek Isinlivi to Chugchilan. 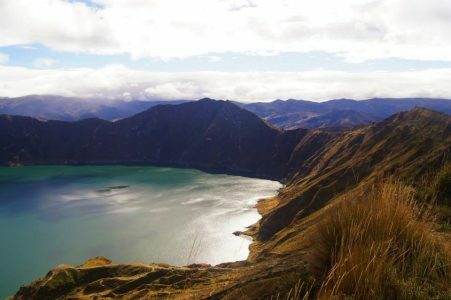 Day 3 Quilotoa Crater Lagoon and transfer to Quito. Day 1 – Transfer to Isinlivi & Cotopaxi National Park Walk (B/D). 6:30: We leave from Quito and head north on a three-hour ride to the small and rarely visited “mestizo” village of Isinliví. 11:00: After breakfast, we start our six to seven-hour hike to the increasingly popular town of Chugchillán. The first section of the trek will lead us through farms, valleys and hills to the Rio Toachi. Along the way, we will enjoy spectacular views of this river from the height of the hills. A hanging bridge over Rio Toachi marks the end of the first section of the trek. From here onwards we will start a gradual ascent to Chugchillán, our destination for the day. On our way, we will go past the small but picturesque village of Itualo. A nice and warm meal will be waiting for us at our hotel. Day 2 – Trek Isinlivi to Chugchilan (B/L/D). This is the more physically demanding day of our trek. We will ascent slightly more than 1.1 vertical kilometres from the lowest to the highest point of the trek. We start at Chugchillán situated at 3.160 m.s.n.m., then we will descent about 250 meters to Quebrada Margarita just to go up again to the rim of the Quilotoa Volcano at nearly 4.000 m.s.n.m. Halfway we will stop at the small town of Guayama. On our way, we will cross indigenous and mestizo farms, climb a beautiful canyon wall and enjoy the magnificent view of the Quilotoa caldera and its lake at the bottom. We will arrive at our hotel by the late afternoon. Day 3 – Transfer to Quito Stopping at Quilotoa Crater Lagoon (B). The trek of this day is usually known as the Quilotoa loop. This beautiful trek is an experience in itself and thus is usually proposed as an independent one-day hike. We will walk along the rim of the crater. The hike involves three to four hours of continues ascents and descents on the rocky and lava peaks of the volcano at 4.000 meters of altitude. On a clear day, we will enjoy a fantastic view of the Cordillera and of some of the most beautiful mountains of Ecuador such as the Ilinizas and the Cotopaxi Volcano. If by the end of the hike we still feel energized we may descent to the Quilotoa Lagoon to take a bath in its glittering waters. After a late lunch, we will get back to Quito where we should arrive by 7 pm. No camping equipment is needed (sleeping bag, mat, etc.). Long sleeves and easy to dry T-Shirts. A backpack of 80-90 litres. Hotel accommodation along the way. Food and beverages during the trek (breakfast- B, lunch- L, dinner- D) as per itinerary.